I read “What to expect. 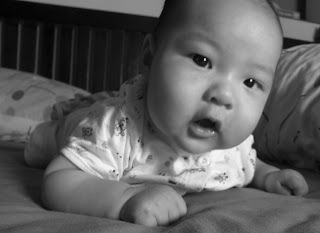 Baby’s first year” and was pretty impatient on when Ziv can actually SHOUT, “MOMMMMMY”. Babies are really very interesting. They surprise you when you least expected them to. 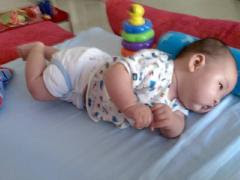 I wish he can walk soon, so I can bring him to shopping centers, becoming my official shopping companion. Tired! I am extremely exhausted. And I feel sick today. Sore throat, persistent flu, lack of sleep… argh… I feel terrible. Now I know why some people will think 24 hours is not enough for them. Every morning I have to wake up at 8am, unlike in the past, I have no chance to actually laze on bed and stare blankly at the ceiling. The moment the alarm clock ring, I better be up, if not, I will be late for work. I have to prepare myself to go work. I have to coo Ziv when he wakes up. 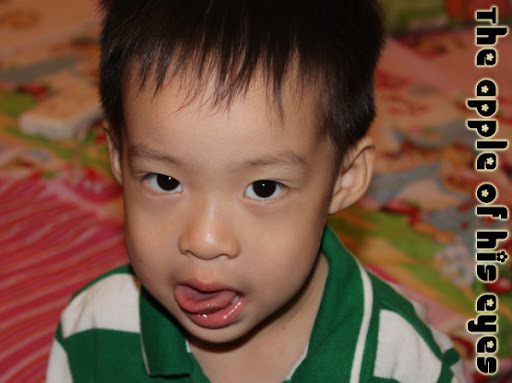 I have to feed Ziv. I have to make my own breakfast. I have to wake Kevin up. In short, I have to be SUPER. I have to drive my mum home. Give instructions to the maid on what to do tomorrow, even though she may not understand my uttering. I have to change Ziv. Prepare what to wear tomorrow. Go through a series of routine to make myself look young. That’s the life with a baby at home. Almost forget to mention what goes on at night, Ziv will occassionally makes some noise that needs my pats and he wll go to sleep again. Although it is as simple as moving your hand to him, I still think it is tiring for me. How can I not feel tired with this action-packed schedule? Not mentioning I have to oversee the running of the tuition center every Wed and Sat. 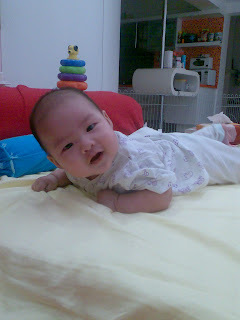 I used to stay awake past midnight, cause I have insomnia, I believe Ziv is my remedy for insomnia. 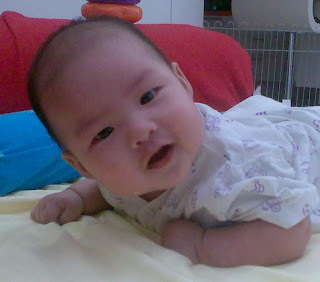 My "universal" pc desktop wallpaper... Ziv going to 3 months this coming Friday. Not being racist here, I realized, there’s an increase of Filipinos working in Singapore. I see them in hospitals as nurses, see them working as maids, see them working at Carrefour service counters, Sakae sushi waitresses, Subway sandwich artists… they are practically EVERY WHERE. No doubt their service standard is much higher than the locals which I really respect, in fact, they are ten times more courteous, attentive and respectful to the customers, but where are the Singaporeans and I truly missed the Singapore culture, the Singapore way of service and the singlish way of asking, “CUE-ME, CAN I HALP YOU?”. That is what I like about McDonald’s. As far as I know, they seldom hire foreigners, mostly local students and aunties, uncles. In other aspect, I wondered, why are the local companies, like Sakae sushi employing non locals as their service staff? I believe Singaporeans are very willing to work as waitresses and waiters, unlike rubbish collectors, which I think we definitely need foreigners’ help. Why are local companies, not even helping the locals to secure a job to ease the unemployment situation? Fine, in business point of view, these foreigners are indeed cheaper than the locals and definitely less demanding, in other words, CHEAP and GOOD. Maybe I am not a business person, and I fail to comprehend and value the benefits of employing foreign workers, but I can’t help but wonder why are we not helping the locals, but investing money on the foreigners, perhaps even offer them courses to attend to upgrade their skills. In kampong last time, Teochews used to say, "Ka Ki Lung", this logic doesn't apply in today's world. Earn money seems to be the most important thing. While traveling, I often pay special attention to the service staff in whatever countries that I visit, just a habit. Generally, our neighboring countries service staff is rather inattentive and slow in reaction, they like to chat with their colleagues while on duty as for Hong Kong, the service staff are rather impatient and easily irritated, as for Taiwan, the service staff are pretty helpful and they greet you as soon as you step into their shops, as for Japan, the service staff are extremely courteous and helpful. I don’t want to have no memories of the service staff in Singapore. I may be exaggerating about the situation now, but who knows, 20 years down the road, no more Singaporeans are working as service staff. Perhaps, our country will be flooded with foreigners that one day, we lost our Singaporean cultures, the homely feeling. Perhaps in future, we don’t need to travel to gain the experience of the foreign cultures, cause Singapore may then be a multi-country country by then.